When you have been cc'd on an email, 9 times out of 10 you have to reply to everyone else that was on the message. Even if you were the only person the message was sent to, 9 times out of 10 you're going to reply, right? Why not have the option to always make sure you're replying to EVERYONE on the message that needs to see the reply? 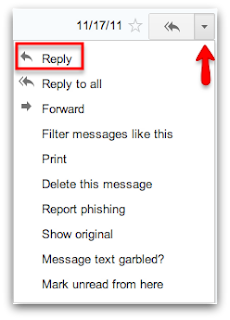 You can, with the 'Default Reply to All' lab in Google Mail! To enable this lab click on the Gear --> Mail Settings --> Labs --> Enable 'Default Reply to All' lab. Or, if you have already enabled a lab, click on the Gear --> Labs --> Enable 'Default Reply to All' lab. This lab replaces the standard 'Reply' option when you open an email message with a 'Reply to All' option. This saves you the time and clicks it takes to access the option from the drop menu. The major difference you will see with this lab is when the message has been sent to more than one person. The arrow that is displayed in the reply box will have more than one arrow, more like a shadow of the original arrow. This determines if the message was sent to more than one person; and now you have the built in option to reply to everyone that the message was sent to. Not to worry, if you want to ONLY reply to the original sender, you still have that option. Maybe you need some clarification on something before you reply to the group ... simply click on the drop down arrow next to the new reply to all option and select 'Reply.' Your reply will be send to only the one recipient. It's important to always double check who you're actually sending the message to. One tip we like to give to people is when you're composing the email message, add the recipient's email address at the END. This will ensure that you've proofread the message and are ready to send it to the person or people. We hope today's post was informative and helpful. Be sure to give this topic a +1 so others can reap the benefits! Also, leave us any comments or suggestions in the comments section below. We appreciate your feedback!